When you go to Japan, you’re going to do a lot of walking. Cities are denser so it’s easier to walk to stores and restaurants. You take public transportation and you walk to and from buses and trains. Or, you may opt to walk to a farther train station to eliminate transferring trains, which saves you money. I often walked over 10,000 steps per day and twice I walked over 20,000. Granted, I was a tourist and shooting a lot of photos in the city. By contrast, my regular suburban U.S. lifestyle yields a measly 3,000 to 6,000 steps. All that walking, along with smaller food portions and no all-you-can-drink fountain sodas might explain why you don’t see a lot of overweight people in Japan. Except for, perhaps, tourists. If you take trains, these escalators, at least in the newer stations, are common. People stand on the left and let people pass on the right. Though oddly, except for Osaka, where people stand on the right and passed on the left. 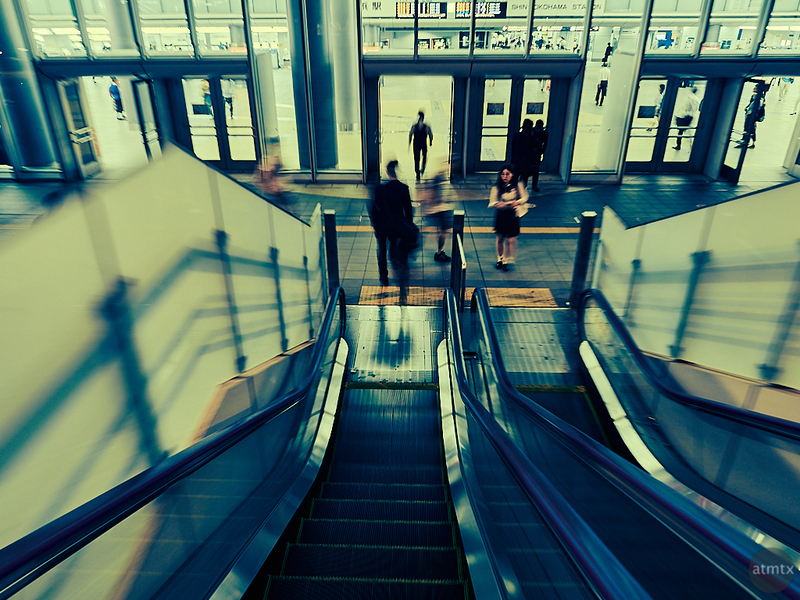 I was usually worn out so I took it easy and let the escalator do the work. Of course there are plenty of stairs too, which gives you a free Stair Master workout. This is the third and last in a mini-series called “Japan on the Move”. Shot with the Olympus with a slow shutter for a deliberate motion blur, along with the alternate reality inducing film-ish effect.